The Saint Petersburg Bede (Saint Petersburg, National Library of Russia, lat. Q. v. I. 18), formerly known as the Leningrad Bede, is an Anglo-Saxon illuminated manuscript, a near-contemporary version of Bede's 8th century history, the Historia ecclesiastica gentis Anglorum (Ecclesiastical History of the English People). Although not heavily illuminated, it is famous for containing the earliest historiated initial (one containing a picture) in European illumination. It is so named because it was taken to the Russian National Library of Saint Petersburg (later known as Leningrad) in Russia at the time of the French Revolution by Peter P. Dubrovsky. 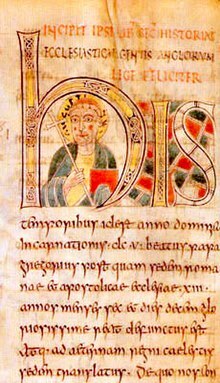 Traditionally, the Saint Petersburg Bede is attributed on palaeographic grounds to Bede's monastery at Wearmouth-Jarrow. It is also traditionally dated to 731/732 × 746 on the basis of the so-called Memoranda, a series of retrospective dates found in the margins of Bede's recapitulo in Book V Chapter 24. The validity of these Memoranda (and similar notes in the Moore Bede) as evidence for the precise year in which the manuscript was copied has been vigorously challenged. While it may not be possible to assign the manuscript to a specific year, it seems unlikely that it was copied much after the middle of the eighth century. The manuscript is written on parchment. It contains 162 folios (numbered 161, but with f. 51 repeated—the correct foliation is given on the last folio in the bottom right corner). Pages average approximately 270 × 190 mm (Writing Space: 230 × 150 mm in two columns of 27 lines). The pages have been trimmed at some point. The manuscript has been copied by four hands, with textual "accessories" (colophons, chapter numbers, and the like) in a fifth (Parkes 1982, 6-11). The opening three letters of Book 2 of Bede are decorated, to a height of 8 lines of the text, and the opening h contains a bust portrait of a haloed figure carrying a cross and a book. This may be intended to be St. Gregory the Great, although a much later hand has identified the figure as St. Augustine of Canterbury in the halo. The figure is identified as a saint, rather than Christ, by his clerical tonsure. Although the letter decoration is essentially Insular in style, the figure shows Mediterranean influence, as do other elements of the illuminations, such as the foliate decoration filling in the B shown above. The Saint Petersburg Bede contains one of the two oldest surviving examples of the "m-type" text of the Latin Historia ecclesiastica (Colgrave and Mynors 1969, xliv). The manuscript also contains one of two copies of the vernacular text of the Northumbrian aelda recension of Cædmon's Hymn in the bottom margin of "f. 107r" (actually f. 108r; see Cædmon). The poem has been copied in the fourth hand of the main Latin text (Parkes 1982, 6). ^ Meyer Schapiro, p. 199 and pp. 212-214, For the view that it represents Gregory, see here. Meyer Schapiro, The Decoration of the Leningrad Manuscript of Bede, in Selected Papers, volume 3, Late Antique, Early Christian and Mediaeval Art, 1980, Chatto & Windus, London, ISBN 0-7011-2514-4 (originally Scriptorium, xii, 2, (1958), also JSTOR etc.). Dobbie, E. v. K. 1937. The manuscripts of Cædmon's Hymn and Bede's Death Song with a critical text of the Epistola Cuthberti de obitu Bedæ. Columbia University Studies in English and Comparative Literature, 128. New York: Columbia University Press. pp. 16–17. ————. 1958a. "A key to Bede’s scriptorium: Some observations on the Leningrad Bede". Scriptorium 12: 182-90. ────. 1958b. "An autograph of the Venerable Bede?" Revue Bénédictine 68: 200-2. Parkes, M. B. 1982. The scriptorium of Wearmouth-Jarrow. Jarrow Lectures. Jarrow: [St. Paul's Rectory]. 5-12. This page was last edited on 17 December 2018, at 00:02 (UTC).